How can they take from what’s always been mine without even taking my permission? It makes me feel jealous, angry, and at the same time, happy. Isn’t it strange? It’s true nevertheless. My city is is called my city because its mine. In all the years of my roaming throughout the sub-sub-continent no one has ever contested my claim over my city: not even my own family members. I love them more for that reason. When a blog post about Banaras is good, it presents a challenge in two ways: it lays its claim to the possession of my city as its own, and it jolts me awake from my lazy literary nap. It’s good when many are drawn towards my city. I feel proud and insecure, for it’s no more mine alone. Sweeping all existential insecurities aside, I welcome all the lovers of Kashi: the kasiphiles. Let the tribe flourish. There aren’t many blogs about Banaras, other than those with purely commercial and promotional motivations. There are a couple of exceptions, e.g. the Kautilya Society blog. The very few other non-promotional blogs but they don’t cover much of the city. London, on the other hand, has over 100 blogs on it, rich blogs, not emaciated ones. The same is true of New York. There are many blogs on Kolkata, Delhi and Mumbai too, but very few on Varanasi: the oldest and tradition-wise, the richest, among all the cities mentioned above. There’s a genre of blogs I accidentally stumbled upon while researching for the blogs on my city: the city-walks web sites. It all began with London I guess, because the prime London walks site is simply called “walks.com”! So, naturally there’s a varanasiwalks.com too. Well let it be mentioned here that putting the name of the cities of India with walks and searching on google, I found that there aren’t many “walks” sites on Indian cities. There isn’t any on Chennai, for instance. Lucknow, Bangalore, Delhi, Kolkata, Varanasi – all have their own “walks” sites. I could locate one blog on Amritsar, but nothing on Agra, Allahabad, Ahmedabad etc. and to finish the list, there’s a purely commercial indiacitywalks.com. I’d love to see a lahorewalks.com in the time to come. Long enough digression! let’s return to the main point, that is my intense jealousy directed upon those writing about, or with a free access to Varanasi. I acknowledge that the statement made above is true. This image has traces of past, distant and near, and imprints of the present time on it. It’s rich in multiphonous echoes, as it is associated to some glorious chapters of India’s past. The temple to the left is “Apu’s Temple”. No, that’s not its name in any of the Mahatmya of the city. Its name derives from the great Satyajit Ray’s Apu Trilogy. Remember that temple behind the little Apu’s head while he watches his father in the first few minutes of Aparajito? Well, that binds his name, and that of the director to the ghat forever. The top left hand corner shows the Darbhanga House. It bears the name of the one time grand kingdom of Darbhanga. It is also connected to the ruckus after the unfortunate and unaesthetic attempt by a big hotel group of Varanasi to improve and modernize it. Some responsible Kasiphiles brought that to the notice of the High Court. At present, no development (?) activity is going on there. Ironically, now the place has become more famous than it has ever been in the past. The two halves of the text above were subjected to two different approaches to the times past and things old. Ray, with his artist’s eyes (he was drawn specially to the ghatscape around Munshi Ghat) found the temple and the ghatscape around good enough for him and his film. Those high up in the management of the Clarke’s Hotel Group, with their apathy and negative aesthetic sense, could see only an opportunity to improve by destruction in the name of modification. The Kautilya Society opposed the madness, and had a real hard time facing the heavy weight pummeling. There’s ample material on you tube on the whole event and its aftermath. One only has to search with Vrinda Dar’s (KS fame) name. There are people in the image-text above, some great already and some waiting for the seal that time will put upon their greatness in the time to come. They are there through association. Legend and history play equal parts in the text of Kashi and the text is richer and more complex than both. In a series of linked posts, a conspicuous logical link is a good point to begin at. There’s a mosque dominating the ghatscape above. 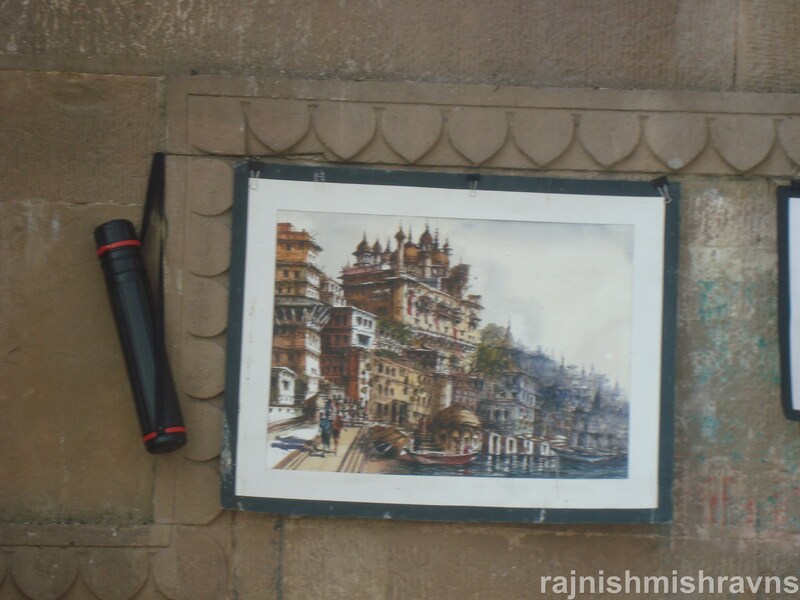 It’s the structure that has always attracted those painting, sketching or photographing from around Panchganga Ghat. Banarsis call it Beni Madho ka Dharhara. Beni Madho is the way they pronounce Veni Madhav or Bindu Madhav, another name of Lord Vishnu. A mosque that bears the name of a Hindu god! I’m sure that Emperor Aurangzebe turns (clockwise or anticlockwise) around five degrees in his grave every time the mosque is designated thus! History says that there used to be one of the greatest and biggest temples of India at exactly the same spot. The temple of Bindu Madhav was second only to the famous Jagannath Temple of Puri for the Vaishnavs of India, and that of Vishweshwar, that the emperor had destroyed too, the first for the Shaivites. Aurangzeb adopted the hard stance, in contrast to that of his great grandfather Akbar during whose reign the Vishweshwar temple was constructed on behalf of Todarmal by his son Gobardhan. Kashi received his ire very intensely because it was the heart of the Hindu India, the main seat of idolatry. The temples of Vishnu and Shiv were destroyed by the conquerors and the material was re-used in the construction of the mosques after the Emperor true to his religio-political inclinations decreed that all the temples of the idolators must be razed to ground. There was nothing new about the incident, neither in the history of India, nor in that of Banaras. 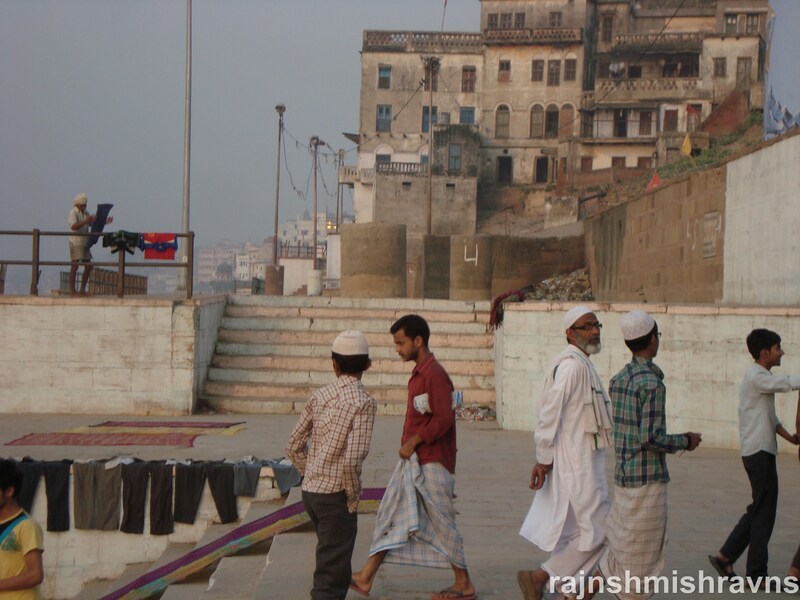 Today, the ghat upon which the mosque stands, and the neighbourhood around are Hindu. Aurangzeb had chosen one of the five core ghats on the riverfront for his mosque. Probably he wanted to add insult to the injury of the Hindu populace, not only of the city but also of the country. In contrast to the towering behemoth on the left hand side, there are small boats on the river that fills the right hand bottom of the image. Boats have always been there in nearly all the descriptions of Banaras and its ghats. Softly they float on the liquid flow. Time is the sheet upon which history writes the larger stories of humanity: its cities. A city is a text: a long or short, continuous or interrupted, easy or difficult to read palimpsest. There is a temple in the city of Kashi that is nearly a millennium old. There’s a tank by the temple that was made pukka a couple of hundred years ago. The houses around the temple and tank, most of them, are not even a century old. They all exist at the same point of time in contiguous spaces. 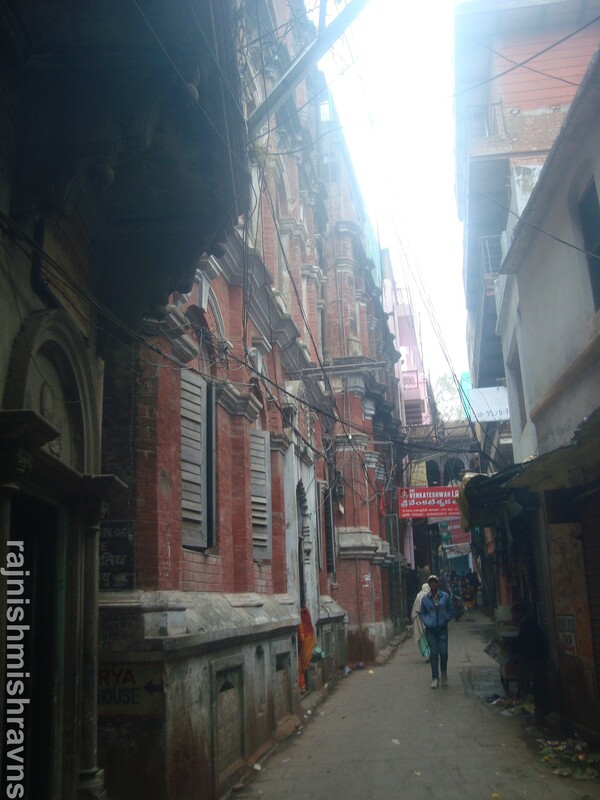 This case presents an extreme contrast that does not repeat itself in any other part of the city, but the temporal gap of hundreds of years does exist between the structures populating contiguous spaces in the palimpsest city of Kashi. What adds to the textual nature of the city is the presence of traces of various times and places in converging at one point. The image above presents a set of things that go into the making of the ghatscape. The name of the ghat, obviously the work of the person painting the little temple a couple of steps above, does not appear as that of other ghats do. At other ghats, their name is painted in black on yellow background, professionally, in an assembly line manner. This one has a personal touch, something that makes it more natural, more human. One both sides of this ghat are the ghats whose name is painted in the uniform black and yellow manner, the method that is not older than two decades at the most. It’s the kind of aesthetic that drives the painting of the stem of trees ochre and white up to five metres from the ground in Banaras Hindu University.The white on red, uneven kind of letters belong to a rougher, more natural aesthetic – the kind that doesn’t exact uniformity from the naturally variable world. This second kind of aesthetic belongs to another time and age. The lingam and Nandi at Dandi Ghatget deman and receive full reverence, as much as any other deity in the city, although they don’t have any temple to house them. They constitute, what may be called, a proto-sacrum of a temple that may grow around its deity in the decades to come, like the little temple at Kshemeshwar Ghat. Or, they may just remain in their present state (before being washed away by the strong flooded Ganga). The two women in the background are from a dominant theme of the text of Kashi: its religious and spiritual primacy for the devout Hindus. I can claim, with the surety that accompanies having spent nearly my whole life in the city, that they are pilgrims, a part of a group that has come to the city in a big bus, or by train. Their group mates must be around, or at least their tour guide. The surface of the ghat is covered with stone, as is the case of the other ghats studding the ghatscape. The past peeps at the joints in the form of nature’s most soothing colour: green. It’s only a trace, but enough to suggest a link of the pukka ghats of today to the sand banks of a century or more ago. The past breathes and pulsates under the stone surface and over it too. 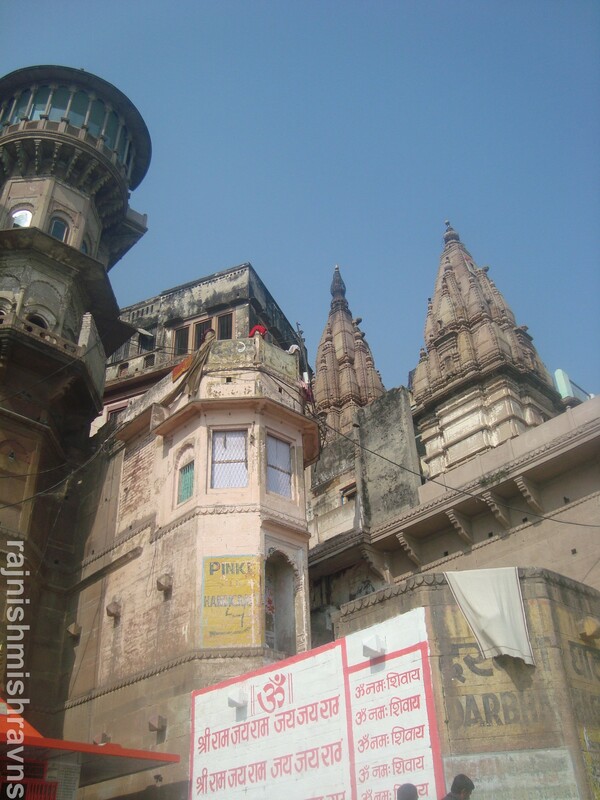 The legend of King Chet Singh of Kashi and its strong association with ghats is underscored by the big red coloured building towards the left hand corner of the image. It is said that Warren Hastings trapped the King of Kashi, Chet Singh, and imprisoned him there. What followed is now recounted in two different manners today: as history and as his legend. Ah, the galis of Kashi! How happy was I when I first met something like them after a long and painful separation! It happened at Sealdah, Kolkata. After that it happened in Udaipur around the heart of the walled city: Pichola Lake, also in old Bangalore and old Delhi and Ghaziabad. Banaras is the point of origin and the search must end there too. Its glimpses I have found in other cities. Glimpses only. I have matched notes with my brother too. About the Ghaziabad galis he felt that they bore some resemblance to those of our city. 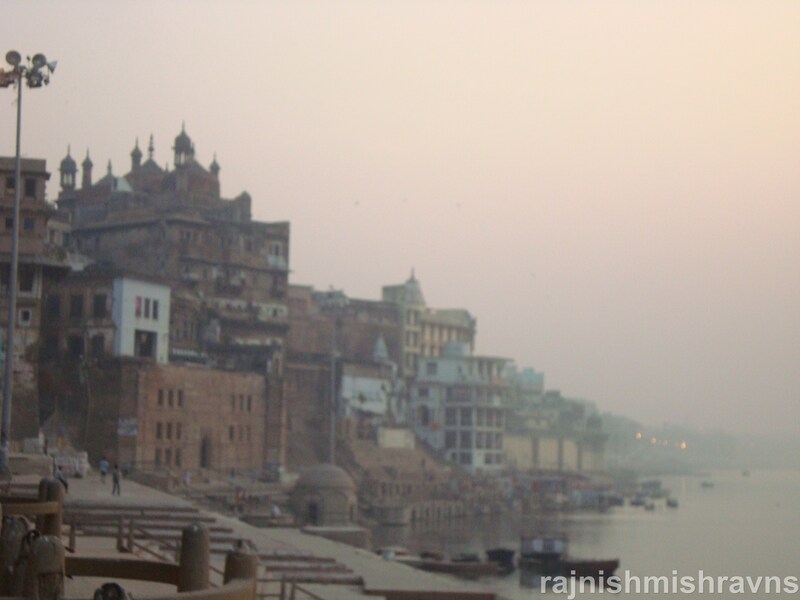 Why so much about the galis of Kashi? Because they form one of the two strands of the Kashi Experience, the other being ghats and Gangaji (I know you are thinking about Ida and Pingla when I mention the ghats, Gangaji and the galis, some may also enquire about Sushumna). The ghatscape is the Sushumna if the galis are Ida and Gangaji Pingla. The city spread in an unplanned manner (but there’s method in this madness), sprouting roots close to where water was, i.e. near Gangaji. Therefore, the densest settlements of the city are along the river, just like those around Pichola in Udaipur. The galis of Kashi: winding, unpredictably changing, and for the novice in the art of navigation – impossibly difficult, are a good read any time of the day. For the beginners, it’d be best to avoid reading them at the peak hours of morning and evening rush, i.e. between seven to nine on both sides of the meridiem. Beginning with relatively calm and quiet galis of old Kashi will be the best. The contents of the paper given below have already been published in the interdisciplinary journal Voices. It’s being put on the blog for the kasiphiles who access this blog for information on Banaras. Banaras, Kasi or Varanasi has been seen as a microcosm for ages. It is said that the cosmos is present with all its constituents in their micro form in the city. The matters non-material can neither be proven nor disproven using materialistic formulae. Banaras is India in its micro form too, and an attempt can be made to prove that at both material and non-material levels. People belonging to various religions, languages, states, castes, communities, and, even countries have lived in the city for ages. As a system, Banaras had always had a dynamic equilibrium between its basic building blocks: the people who live there. As far back as the light of history can show, Hindus of various castes and sects have always been a significant majority in the city. James Prinsep’s record of the population of Varanasi in the first half of nineteenth century shows that roughly 67 percent of the population was Hindu and 17 percent was Muslim (14). He had also mentioned the number of temples and mosques in various localities of the city. There were 1000 temples and 333 mosques in the city back then (13), i.e. the ratio of temples to mosques is 3:1. He had subdivided the urban zone into various areas viz. Dasaswamedh, Bhelupura, Adhampura etc. Later on, Sherring had provided amended data. Even then, the ratio of temples to mosques remained the same. He had reported the numbers of temples to mosques in the ratio of 1:3 at Jaitpura, and 8:9 at Adhampura, both with a high concentration of Muslims. 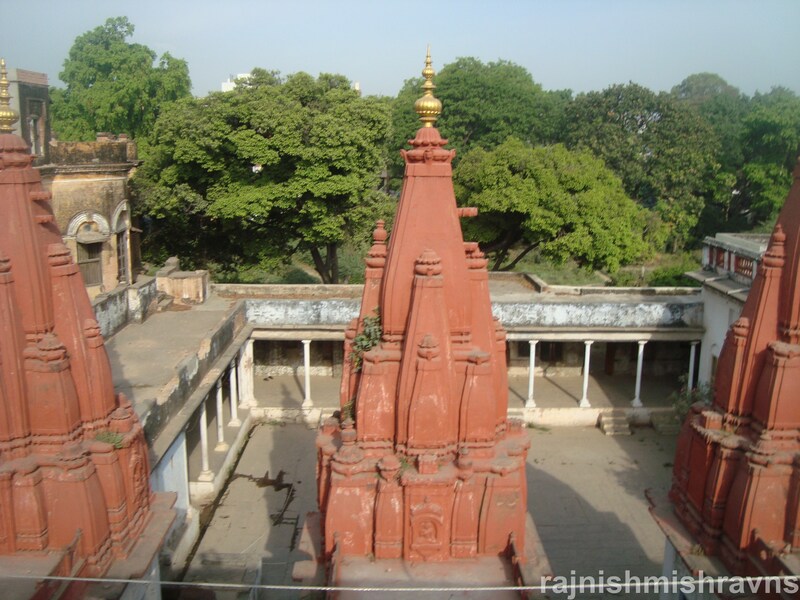 At Dashaswamedh the ratio was 20:1, with the overall count as 1454 temples and 272 mosques (42). The present paper studies the area between Sonarpura and Shivala. The area covered here falls under what Sherring had kept under Bhelupura. There are 83.7% Hindus and 15.9% Muslims in Varanasi according to the Census 2001. Muslims have always been a minority in the city, but a very prominent and significant one. They have contributed to the formation of the material and cultural essence of the city. They have been subject to a long tradition of essentialization and amorphization that has stripped them of any kind of agency and existential responsibility of becoming. They have become a prototypical “them’ for the majority of the members of the majority religion in the city. Banaras is the oldest continually inhabited city of the world (Eck 5). Through centuries of conscious and unconscious magnetization, the city has formed religion (and caste) based domains in at least its older quarters. It’s the religious geography of one of the most densely populated zones of the city that informs this paper. The area chosen for the purpose of demonstration of what lies at macro-sociopsychological level comprises of the domains arrayed round the axis of Harishchandra Ghat Road. The axis divides the quadrilateral shaped area with the north and south lines that are parallel to it having Kooch Behar Kali Bari and Panchkot Kali Bari on them. Like Prinsep’s study, no attempt will be made to include the hundreds of temples in the niches, under trees etc. that are very common in the Hindu quarters. Neither will all the temples in private houses be included in the total. The concept of a private mosque for a household does not exist, as far as I know. Only larger public temples (larger in comparison to the niche-tree type) and mosques proper shall be considered for the study. As the number of Muslim places of worship is comparatively less, let’s begin with them. There’s a mosque at Shivala, right behind Panchkot compound. There’s another at Chhipi Tola near Hanuman Ghat and another by Sonarpura-Shivala main road, near Prasad X Ray. 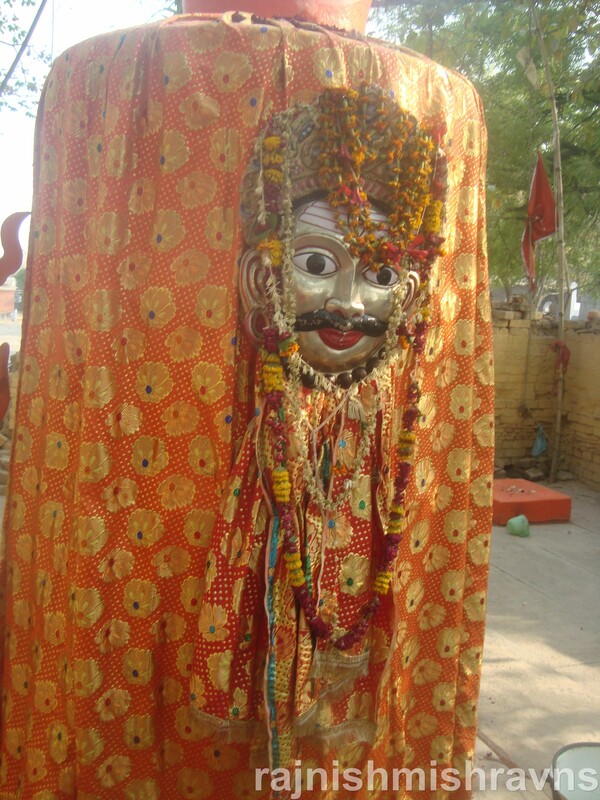 There are two shrines: one at Shivala Crossing and another near Sonarpura Crossing, near Kooch Behar Kali Bari. 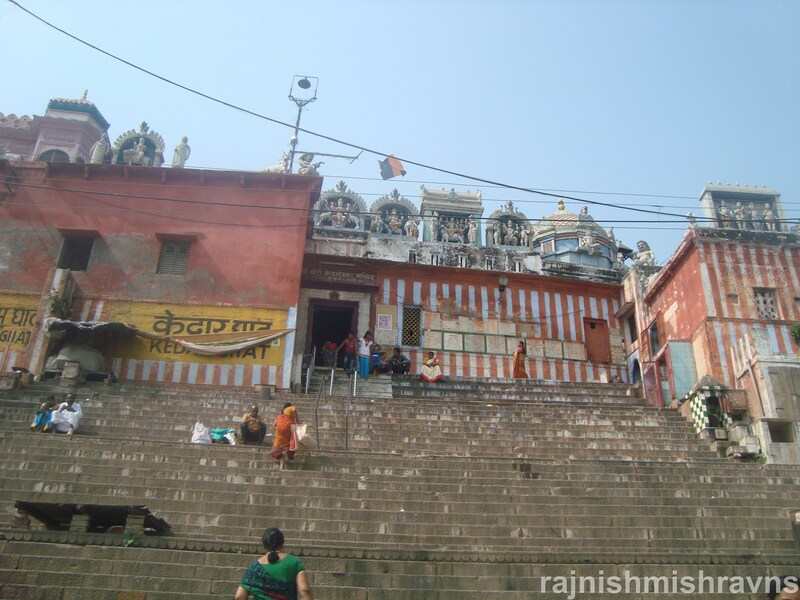 Sri Kedareshwar Temple at Kedar Ghat is the nucleus of Kashi Kedar Khand. The clanging of huge bell of this temple can be heard, especially early in the morning, in a very large area around the temple. Some people find it convenient to designate as kedar khand the area within the boundaries of which the sound of the bell is audible. Therefore, the area covered in this paper roughly corresponds to the same. This fact alone will suffice to explain the large number of big, small and very small temples in the locality. The core of this zone is the temple that lends its name to the zone: Sri Kedareshwar Temple. Hanuman Temple near Hanuman Ghat, Chintamani Ganesh Temple at Harar Bagh, Kali Bari at Pandey Haweli and the temple made in the south Indian style near Harishchandra Ghat are the well known larger temples of the zone. A newly constructed temple of Sai Baba at Harar Bagh draws huge crowd of the devotees, Hindus, of the locality. The rise of the popularity of Sai Baba amongst the Hindus of Banaras is a recent phenomenon, and the small temple (that was originally just a collection of various other Hindu idols) in an unknown lane of the city lends its name to the locality now. As mentioned already, there’s a really large number of smaller temples and idols on various ghats and lanes of the area that, if included to the grand total, will pull it beyond just one hundred. So, the ratio of the Hindu and Muslim religious places is roughly 10:1, that’s mush more in comparison to the same a century and half ago. There’s a definite mechanism of the construction of the houses of religious worship. They have a lot to do with the socioeconomic strength of the community to which they belong. The changing ratio tells its own story, but it needs to be interpreted for a better understanding. A jump from religion to demography may seem abrupt at the surface level, but there’s an internal justice for the jump that becomes clearer gradually. The locations that have mosques or Muslim shrines also happen to be either densely populated Muslim domains or they are contiguous to such domains. The collective un/conscious of Hindus and Muslims has programmed their habitation patterns and religious microgeography too. In any other circumstances it’d be called ghettoization, but looks could definitely be deceptive. The muhallas can never be called ghettoes and the populations of the muhallas of both the communities have houses constructed of similar material where live people of similar sociocultural and economic backgrounds. Hence, a benefit of doubt kind of thing starts its play in the mind. Yet, when surface is scratched, one sees a subtle and successful attempt at ghettoization here. Markers like fencing, barricading, restrictions on movement pattern and coercive control may be absent from these ghettoes, but there’s something about the polarized population’s mind that makes their ghettoes within. There are lanes of Hindus and those of Muslims that pride themselves on being 100 percent pure, i.e. there’s not a single house there that belongs to a member of the “other” community. Not only the ownership pattern of these lanes is homogeneous, but also that of those staying on rent. Of course, there are some areas where the boundaries of habitations fuse – where there’s a marked heterogeneity in the composition of population. Homogeneity translates into absolute power, and power asserts itself in free display and construction of the markers of identity. Hence, all the mosques are in dense Muslim domains and the two shrines are by the main streets of Sonarpura and Shivala, nearly marking the limits of Muslim and Hindu populations on their sides. It may be just coincidental, or it may not be, that members of both the communities have (at least theoretically) free access to the shrines. The boundaries of Muslim domains (ghettoes?) and those of their Hindu counterparts touch these shrines. Jhanda Tare and Shivala are the Muslim domains whose boundaries touch the shrines either nearly or actually. The mosques, as mentioned already, are embedded in the domains, except in one case. The temples are deep inside Hindu domains. Religion has always been one of the main sites of the contest of power in Varanasi. The history of riots in the city, that dates back to 1809, affirms the centrality of religion in power contests and the fusion of religion with socioeconomic factors creating the juggernaut that’s finally satisfied only when it had taken the sacrifice of many lives – both Hindu and Muslim. The location of the places of worship too becomes significant in a clime like that – more so, in heterogeneous than in homogeneous localities. The clearly and homogeneously Hindu or Muslim domains are generally free of any kind of property purchase pressure from the “other” community. There’s a taboo against selling property to the “other” and those with social roots in the locality and city know it well. So, aberrations happen very rarely. The heterogeneous domains provide interesting opportunity for the study of domain re-formation, expansion and contraction. The area around the two shrines mentioned already and one mosque in heterogeneous localities prove the point well. Due to their importance for one community property around them is in high demand amongst the members of Muslim community. They feel the need to buy in order to homogenize the domain and tilt the power balance in their favour. It’s happening slowly but surely – the homogenization in favour of the community to whom the mosque and the shrines belong. Religious cartography and domainization are aspects and expression of power – the same power that was coveted and contested for back in 1990. The matter of the ownership of their place of worship has an uncanny hold upon the collective un/conscious of the people. It has been proven time and again and proven very conclusively through the rise of Bhartiya Janta Party in the 90’s. No prominent temple of kedar khand is embedded in a Muslim domain. The same can’t be said about the Muslim places of worship. This indicates towards a larger phenomenon. The inter-community power distribution is proportionate to its comparative population density in a given locality. Thus, there’s no contest or confusion about power in homogeneous domains, it’s only in the heterogeneous ones where heat is generated due to intercommunity power friction. The quadrilateral covered in this paper has two nearly homogeneous Muslim domains at Shivala and Chhipi Tola, and one very little homogeneous strip near the shrine at Sonarpura. The last population is not being termed a homogeneous domain because it’s a weaver muhalla of around twenty-five Muslim houses, the last one of which is where the compound of Kooch Behar Kali Bari starts and the first one behind the shrine. Varanasi has a long history of the parallel lines of communal harmony and disharmony between the two dominant communities of Hindus and Muslims. Harmony isn’t as conspicuous as disharmony because of the shock value of the later although the line of disharmony is neither thicker than the other one, nor is it unbroken. Moreover, its being an aberration sets each instance of disharmony apart from the continuous line of harmony. The flashed points on the line of disharmony are many, and 1809 is where the availability of detailed records began. The riots of 1809 were about intercommunity power friction in a heterogeneous domain, so were many riots in the later years including the riots of 1990’s. All those riots had something to do with a temple, an idol or a religious procession, and the point from where it began had almost always been in a heterogeneous domain. The heterogeneity of domains has a close connection with the risk of disharmony’s overpowering harmony and culminating into a set of violent and hateful actions that are clubbed together and called a riot. There’s a close but not one-to-one relationship between them, as heterogeneity is a constant factor in many localities but disharmony, in its mild to extreme forms, appears only sporadically in the stream of time. What is it that creates differential response to the same stimulus? Why is the entropy of the system maintained in some cases and challenged in some other? Why and how do many heterogeneous Muslim domains remain harmonious most of the time? Studies of riots point towards planned and concerted action, manipulation and the involvement of external agents in breaking down the equilibrium of the system. The mechanism of creating conditions favourable for riot-mongers has been studied in detail in many cases. Engineer and Pandey, both have shown how socioeconomic factors play a very crucial role in mobilization of masses after rallying them around something linked to their survival at basic level, e.g. safety of life or property. Social programming at intra and inter-domain levels plays a very central role in the formation and solidification of differential identities and in the vilification of the “other”. Those looking for opportunities to create communal friction get ample support from an already biased and paranoid mind programmed against the essentialized “other” since its infancy. Rumours have always played an unacknowledged yet significant role in the initiation and spread of unrest, especially when the situation goes out of control due to system failure. The intercommunity power friction has a full range of intensity, from its milder and harmless forms to the extreme one of full scale communal riots. The level of heterogeneity of a domain is one of the factors that determine whether friction will translate into full scale communal riot and violence or will remain smoldering for a long time, apparently harmless, waiting for the winds of circumstances to blow from over it and convert it into its more vicious ramifications. It becomes very important, therefore, that the heterogeneous domains are watched over closely and studied intently for devising prophylactic measures. “Basic Data Sheet (Varanasi) – Census 2001”. censusindia.gov.in. n.d. Web. 17 December 2013. Pdf. Eck, Diana L. Banaras City of Light. New Delhi: Penguin, 1993. Print. Khan, Rafiq and Satyaprakash Mittal. “The Hindu-Muslim Riot in Varanasi and the Role of the Police”. Communal Riots in Post-independence India. Ed. Asghar Ali Engineer. Hyderabad: Sangam, 1997. Print. Pandey, Gyanendra. The Construction of Communalism in Colonial North India. New Delhi: OUP, 1990. Print. Prinsep, James. Benares Illustrated in a Series of Drawings. Varanasi: Vishwavidyalaya Prakashan, 1996. Print. Sherring, M. A. Benares: The Sacred City of the Hindus. New Delhi: Low Price Publication, 1996. Print. Kashi, the religio-spiritual magnate that attracted Hindus from all over the world, had once been a city of thriving commerce, as its history tells us. Dharm, arth, kaam and moksh: all have been adequately, abundantly and surely available to the dweller of the city. Of course, moksh came into the equation once a person had reached a certain age, i.e. the stage of life called vanprasth. The first three objectives have always been in play behind a migrant’s decision to reach the city and settle there. That remained the case until the first few decades of the previous century. The story of the city, and that of its people, changed with the changing economic and cultural geography of India, and the world. From what used to be one of the major cities of the state, as far as commerce is concerned, Kashi became its backwaters. The ten years, somewhere in the middle of the twentieth century, i.e. the decade after India got independence, brought more change to the city’s socioeconomic structure than the whole century preceding that time had seen. Of course, the economy and the government of the country had changed, so, the fates of the people naturally had to change. Urballaghologically speaking, the change was going to shock people in a very slow and belated manner. The contrast between the pristine past and the present plastered with muck, and blaming it on modernization and mechanization, has been a strategy adopted by all the Luddites through ages. That’s not what urballaghology does. It does not aim at spreading panic and destroying things. Its aim is balanced thinking and preservation: preservation of whatever was good, whatever worked well for the people and was pushed aside by the new without a proper hearing. Banaras, and the world, have always been changing as change is the only unchangeable thing. Urballaghology doesn’t aim at opposing change with the purpose of arresting the flow of time. That isn’t possible. The idea is to protect what has been at the core of life and identity of the city and its dwellers. Recognizing the factors causing change and the factors that may alter its rate, and then doing things to counteract its negative effects. Migration of talent and youth to the city of Kashi had been the popularly observed phenomenon that also finds place in traditions, oral and printed literature. Migration away from the city was something new. In the beginning, when the phenomenon was still new, people could not fully realize what was happening to their city. There was one more reason behind it: the large number of people descending upon the scene from the nearby areas of Bihar and Uttar Pradesh. Thus, the influx counterbalanced the out-flux and the city did not become deserted. Those born in the city, after having secured their degrees from its (then) world class university, left it for the greener pastures. What else could they do? They were the ones who worked, not the ones who created employment opportunities. काशी कबहूँ न छोड़िए, बाबा विश्वनाथ दरबार. The true believers remained in their city. The more materialistically inclined left, only to look back and think about their good old (dawn, morning, afternoon, dusk, evening and night) = days of Kashi. Those who belonged to neither categories, i.e. they remained not because they chose to but because they couldn’t leave, such persons stayed back and hated each day of their trapped existence in the city of filth. For them there was no city of light, as both the cities are one. Proving the laws of space in Physics wrong in its own way, Banaras is two cities at one time: the city of light and of filth, and a person can either see both and live in one or see one and live in it. The Kashi one sees is the Kashi one gets. The equation of pure Banarsipan has many variables in it. One of its important variables, in the eyes of the jury i.e. the other Banarsis, is the length of their stay in the city: in terms of decades and centuries. Banaras has been a city that acted as an educational and religio-spiritual magnate for the Hindus of India since the time of the Delhi Sultanates. Come they would, the Hindus, to the city that rested at Shiva’s trident. The less fortunate ones would stay for a day, week or month and then leave. They were called the pilgrims. The more fortunate ones came to Avimukta, the city that Shiva never left, never to leave. They came for Kashiwaas or Kashilabh, depending on their age and health. With these religio-spiritual migrants came those members of their family that would stay in the city either for the lifetime of the root member or even after they are no more, as independent individuals. The other kind of migrants were those who came to the city of knowledge, of light, to graduate in one of the disciplines of knowledge. Post graduation, they would either return to their place of origin or would stay back in the city of their alma mater. My grandfather had come to the city with his grandfather and his mother back in 1938 (seventy six years ago). 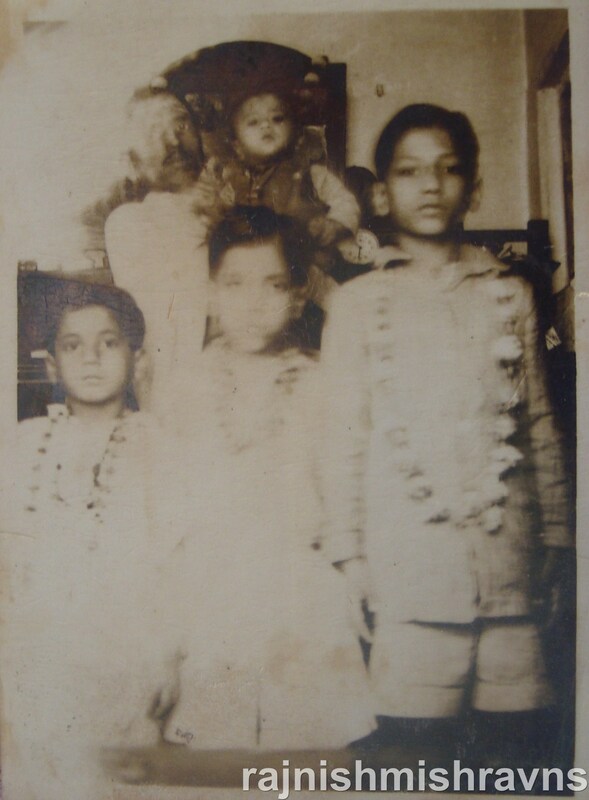 My uncle (the little boy standing in the middle) gave me the key information regarding my family in Banaras. They belonged to Mithilanchal in today’s Bihar. I have been to my paternal place of origin only once. It’s a village called Bhittha More in Sitamarhi district (used to be Muzaffarpur district once). It’s very close to India-Nepal border, near Janakpur, Nepal, the place where Mithila’s king and Maithili’s father King Janak used to rule from. Mithila was known as Videha in olden times and comprised of a large chunk of Bihar and Nepal, as wikipedia informs, between the rivers Ganga, Kosi and Gandak. Janakpur, its capital, is in Nepal. Maithils Brahmins have roots in Mithila and those I know keep visiting their village back home. My family’s direct link with the village had been weak for the last three decades. It’s absolutely nil now. My father (the boy standing extreme left) and all his siblings were born in the city. Those were the times of high infant and child mortality. Tragically then, out of seven siblings of his, only five survived. They all went to the same school and then to the same university, “The University”, the Banaras Hindu University. The University itself was established just a couple of decades before their father’s arrival to the city. My grandfather himself had never attended any university. He was an autodidact who had taught himself Sanskrit so well that he could actually teach Kiratarjuniyam to a postgraduate student while having no degree in the language himself. What’s more, he had learnt the language for karmkand (rituals) and had learnt it so well that he could teach literature too. I am recognized among the Maithils of my city with panditji, i.e. my grandfather’s name and his identity as a scholar. The city’s history, and that of the family were intertwined in a way. I have always wondered, since my childhood, about my grandfather and the years 1942-47, i.e. the years between the Quit India Movement and India’s Independence. There’s no help that can shed some light in that direction. Grandpa’s old Geeta Press pocket journals, some of which I had kept carefully in my treasure box, are all gone – eaten by termites and burnt later. It was in one of those dainandinis that I had read that my father was born on 30 January 1948 – the date of Mahatma Gandhi’s martyrdom. I don’t remember having seen any reference to my grandfather’s involvement, or even interest, in India’s struggle for independence. So, I may safely guess that my grandfather (should we call him a Banarsi in 1942 when he had reached the city in 1938?) and many people like him, those who were new to the city, were still struggling with acclimatization while many Banarsis were struggling for their independence. To be fair, it must be mentioned that many non-Banarsis new to the city had participated actively in our struggle for independence in the short span of their stay in the city. Their names include the likes of Chandrashekhar Azad. So, the second world war and India’s struggle for independence could not alter the noiseless tenor of grandpa’s life. He was a migrant to Banaras but his children, three of whom were born between 1942 and 1947, were to be Banarsis who migrated to other cities. His story and that of his sons is also the story of the city. It didn’t take more than a generation for the time to change the city and the life of those attached to it. I have seen my city with Hindu eyes. I’ve enjoyed its ghats, galis and Gangaji as a Hindu. 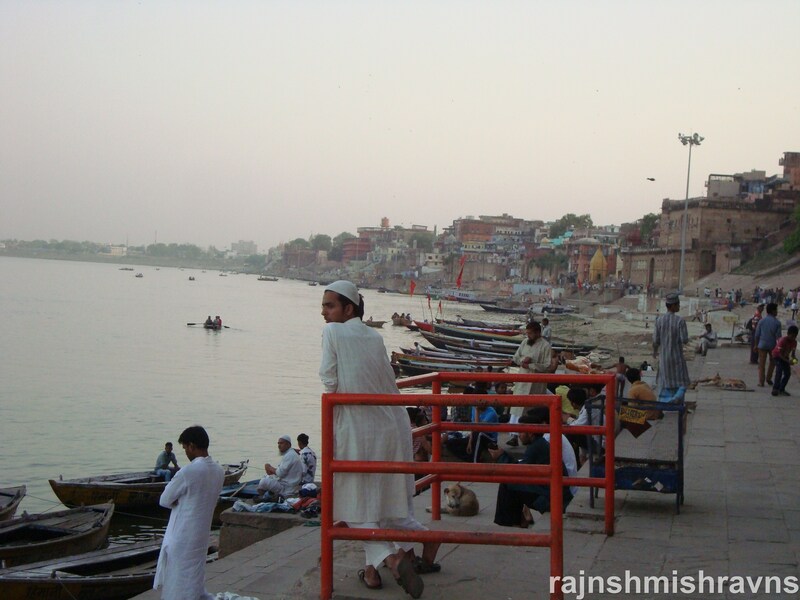 In last few years I have been curious to know about the Banaras experience as a Muslim. When I returned to my city, I returned with a heightened consciousness towards certain things: a consciousness that gave me a whole new perspective. It enabled me to see things that were new to me, and also the old things in a new light. Distancing has a beneficial critical effect on my analytical faculties, it seems. So, while my walks through the ghats I started marking things that I’d pass without noticing in my previous life. The span of my stay being so short, an acute sense of shortage of time and the accompanying need to absorb while observing, have always accompanied me on my trips. Moreover, camera, the friend of observing man, has also helped me in many ways: in both capturing and recalling moments. It was while looking at the images taken in my last trip to Varanasi that I discovered my “Muslims at Ganga Ghat” photos. I was fully aware of my purpose while clicking them back then: that I wanted to do at least one post on Muslims at ghats, just like I have been planning to do a post on “Women at Ganga Ghats”. Later on, I was caught up with other themes. Finally, I committed myself to the post by uploading a few images from my collection. The one image that I posted in the beginning is accidental. 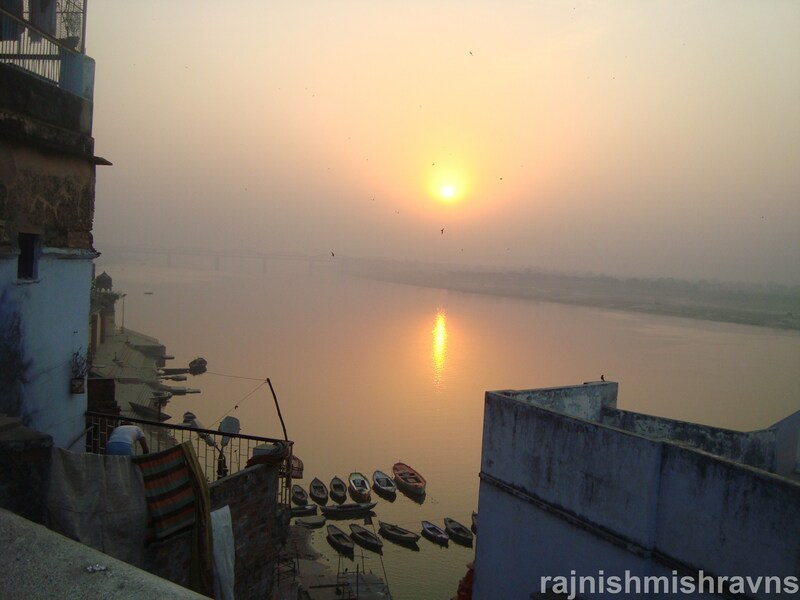 I was clicking my camera indiscriminately, as I always do when rising or setting sun is around and I’m in Banaras. It was a regular trip from Karnatak State Ghat to Digpatiya Ghat. Something in the ghatscape changed at Rana Mahal Ghat. The Muslim identity markers viz. 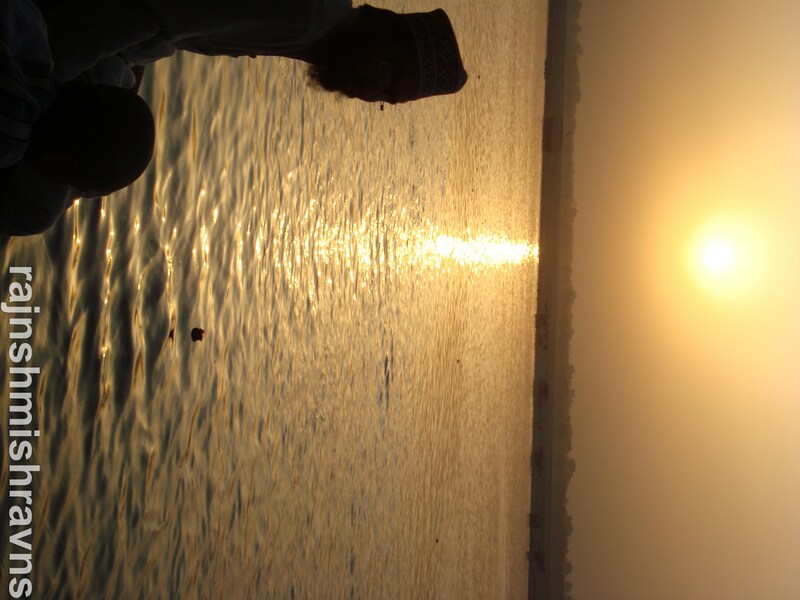 white kurta and pajama, check lungi, the distinctive skull cap, along with the beard made it clear that the ghatscape demography had been suddenly inverted.There was this gentleman enjoying the rising sun, and I took their photograph without asking them. The ghats around Harishchandra Ghat have no Muslims because it’s the ghat where Hindus cremate their dead. Kedar Ghat has the popular Kedar Temple and is always filled with either the permanent or floating Hindu population. Chowki, Kshemeshwar and Mansarovar Ghats belong to washermen and boatmen and are of low value for the pilgrims. They are not good for those who wish to enter the river. Narad Ghat and Raja Ghat receive South Indian pilgrims and Pandey Ghat has a high concentration of Japanese and other foreign nationals. Finally, we reach Chausatti and Rana Mahal ghats. 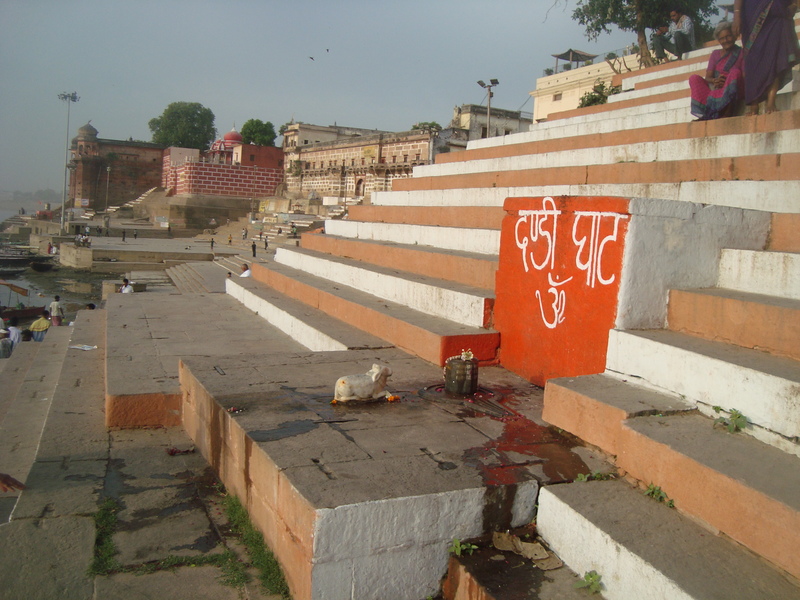 These ghats probably receive the Muslim populations of Madanpura and allied lanes that are in the vicinity. People come there to sit, chat, play cricket, take their bath, swim in the river or for boating, and generally have some good time. Good time is guaranteed in the city of good life, especially when one has already reached its font of life: Gangaji. The river has a definite and deep effect on human mind: “Peace comes dropping slow” on the ghats (Yeats, “The Lake Isle”). I couldn’t chat with anyone there as I was rushing forth to my destination and I’d come back, predictably (Sitting duck, my friend Rishi calls the locations where I return again and again. According to his theory, I can postpone photographing them for the next visit, and then the next!). Well, life is both short and unpredictable. I don’t plan it, but any day can be my last. The sitting duck theory is not for people like me then. No interactions or interviews took place on those ghats. I simply clicked a couple of images and walked on. From Chausatti Ghat onwards there are major Hindu Ghats: Dashashwamedh, Manikarnika and Panchganga. Along with Assi, Kedar and Adi Keshav Ghats, the three ghats previously mentioned receive the maximum foot fall on both normal and festival days. There are a couple of ghats around Teliyanala Ghat where a definite Muslim presence can be felt again. Then again, towards Assi Ghat, they can be seen at Prabhu and Chet Singh Ghats. Chet Singh Ghat is famous for its bird population. Wild pigeons, parakeets and mynahs have made their nest in the niches of the palace gate and wall. There are people from the neighbourhood who come to the ghat to feed the birds and the fish. Feeding fish is a popular activity in Kashi, as it’s considered as a part of dharma by Hindus, and Muslims like it too. 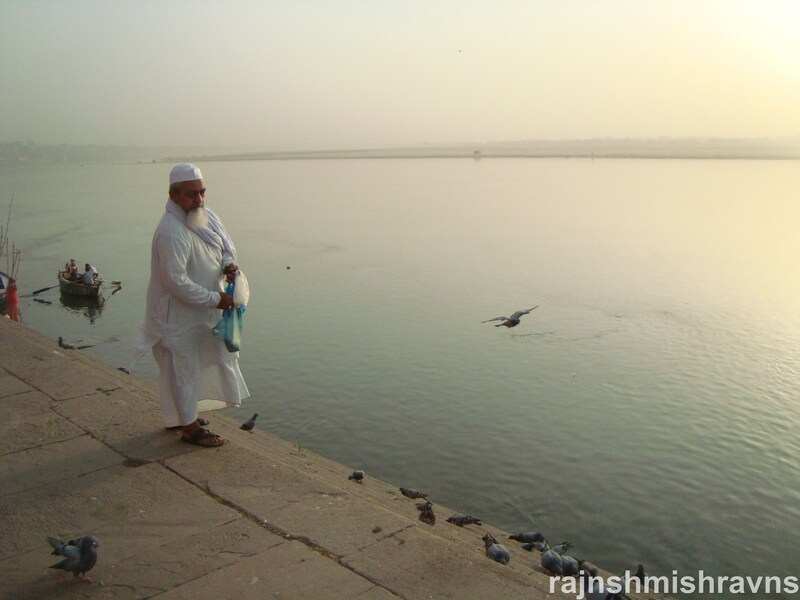 Although Prabhu Ghat is the favourite spot of the Banarsi anglers too, many of them Muslims from around. So, I spotted this gentleman in my early morning visits to the ghat. He would come with a polythene sack full of bird feed and would start beckoning them and scattering the feed on the steps of the ghat. The birds would come flying to their friend. Amateur photographers like me find the moment and place just right for shooting at will, and indiscriminately, hoping for rich rewards. He is as regular as the other Banarsis on this ghat and on other ghats. The city’s rhythm has become one with the rhythm of his life. Banaras has grown into him, sprouted roots and all. Once more, it should be made clear that other cities have their rhythm that become one with many living there, and I’m not claiming uniqueness for my city here. I’m only pointing towards the obvious and noting it down for others to see too. And yes, I’m generalizing because I don’t have more data to particularize with. While walking towards Raj Ghat I saw a woman in naquab near Naya Ghat. This trip of mine was special as I observed, contrary to my previous view, that women are present throughout the ghatscape, if not as strongly as the men of the city, then at least in larger numbers than what their numbers used to be in the past. More about that some other time. The image above was taken with the purpose of showing a Muslim woman at ghats. It was around seven in the morning. The couple, I am sure, sat there facing the river and the newly risen sun from behind its further banks. Had I been more poetic I’d call their pose meditative. Being what I am, let’s just say that they were enjoying the morning moderateness of the otherwise unbearable sun rays. 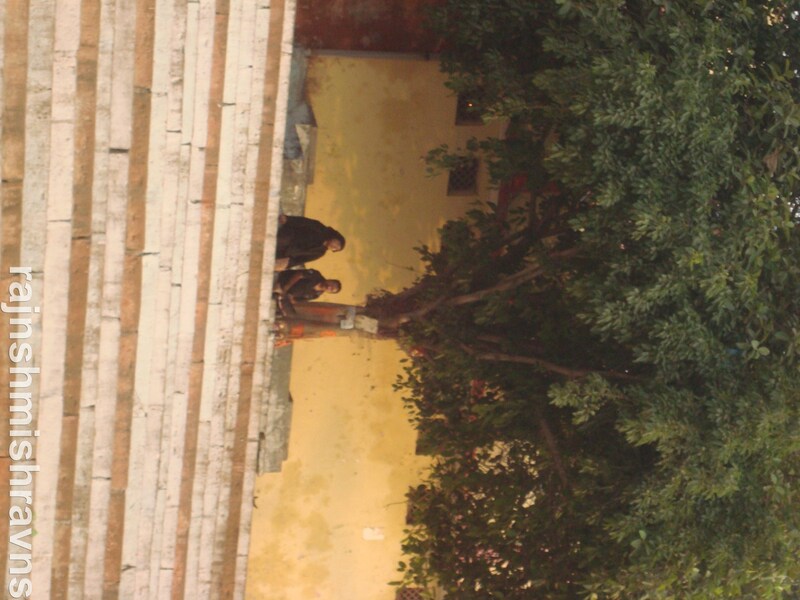 They were completely at home: a fact that tells me that they are regulars to that ghat and the routine: pukka Banarsis.